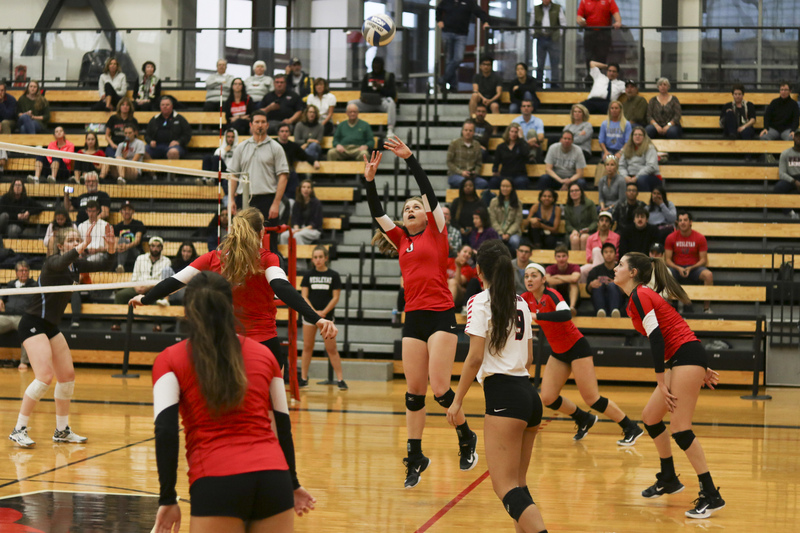 The volleyball season came to a dramatic end this weekend, as the Cardinals made it to the second round of the NCAA Division III tournament before falling to Johnson & Wales in a nail-biting finish. It all started on Friday night in a matchup against Wellesley College. I can only imagine how hard it must have been for the announcers of the game: both schools start with a ‘W,’ have a ‘Y’ near the end, and the same letters in the middle – who can blame them? Yet by the end of the match, the Cardinals had shown everyone watching an easy way to differentiate the two schools: by their volleyball teams. Wes did what it does best, and dominated in a 3-0 shutout of the Blue. The Cards led the first set from the beginning, clinging to a 7-2 lead. Their early energy carried them through the first set with ease, leading by as many as 11 points after a kill by Nicole Hilton ’20. Then, the Blue fought back to cut the lead to seven, making the score 23-16 and forcing Wes to take a timeout. After the timeout, the Cardinals ran back onto the court and scored two quick points, including a final kill by Stasie Litinsky ’20 to win the first set 25-16. In the second set, Wellesley started out on top. The Blue led 6-3 before the Cardinals worked to tie the score at six. From there, the teams traded points until Wellesley led 15-13. Then, Wesleyan scored seven unanswered points to take the lead that would eventually give them their second set of the day. With the score at 24-18, Olivia Guidotti ’20 served a beautiful ace to finish the set. The third set started with back-to-back kills from Harper Graves ’21 and an ace from Phia Bellizzi ’21 to make the score 3-0. Still, Wellesley didn’t make the game easy as they went on a 9-3 run to take an 11-8 lead. Wes later pulled ahead to make the score 24-20, and it looked as though they had clinched the victory. But Wellesley refused to give in and went on a brief 2-0 run to force a Cardinal timeout. The Cardinals came back on to the court ready to win, and a kill from Hilton gave the team their second-ever NCAA tournament win. With this victory, the Cardinals moved on to the second round of the tournament, where they played the Johnson & Wales University Bobcats for the second time this season. The Bobcats are currently ranked eighth in the nation and beat the Cardinals 3-0 in the regular season. When the two teams faced off on Saturday night, Wesleyan needed to play at a much higher level than before. The Bobcats scored the first four points of the match and jumped ahead to a 10-5 lead. To anyone watching the game, this may have looked painfully similar to the beginning of the teams’ regular-season matchup. This time, however, the Cardinals didn’t let the Bobcats intimidate them. Down five points early on, Wes continued to fight and eventually rallied to lead the set 21-20. Then, with the game tied at 22, the Dirty Birds went on a 3-0 run to win the first set, 25-22. The second set continued with the same competitive energy as the first set while the teams traded points back and forth. After a 4-0 Bobcat run gave Johnson and Wales a 10-7 lead, Wesleyan took a timeout and came back to score six of the next seven points to regain the lead. Soon, the Cardinals led 18-17, but an 8-1 Bobcats run gave the Bobcats the second set, tying the match at 1-1. The Red Birds came out ahead in the third set, leading 3-1 before a series of attack errors that gave the Bobcats a 5-4 lead. Later, behind 11-9, the Cardinals went on a 4-0 run to reclaim the lead and force a Bobcats timeout. Still, the Red Birds were able to maintain their momentum and scored five of the next six points to take a 21-16 lead. From there, Wes never let the Bobcats back into the game, and a Hilton kill sealed another set for the Cardinals, this time 25-20, giving the team a 2-1 edge in the match. Behind for the second time in the match, Johnson & Wales came out hot and went ahead 9-1 early on. The Bobcats carried this strength throughout the set, never letting the Cardinals score more than two points in a row. Despite the Red and Black’s efforts, the Bobcats won the fourth set with a decisive score of 25-13 to tie the match 2-2 and force a fifth set. The fifth set started off with a point for Wesleyan and then went back-and-forth between the teams until the Bobcats regained the momentum they had found in the fourth set. Johnson & Wales pulled away from a 4-4 tie with an 11-1 run and won the shortened set 15-5. This season was full of excellent victories for the Cardinals. As a team, they were Little Three and NESCAC champions. Individually, Hilton was named NESCAC Player of the Year in her sophomore season and joined Litinsky on the AVCA Northeast All-Region First Team. Bellizzi capped a stellar freshman season by being named to the NESCAC Second Team. With all but one player returning next fall, it looks like the 2018 season is going to be equally exciting. This year, Coach Ben Somera felt that the maturity of his team was their main setback. After seeing how much the team improved from the 2016 season and throughout this fall, it looks like the Cardinals are going to be the team to watch come next year.